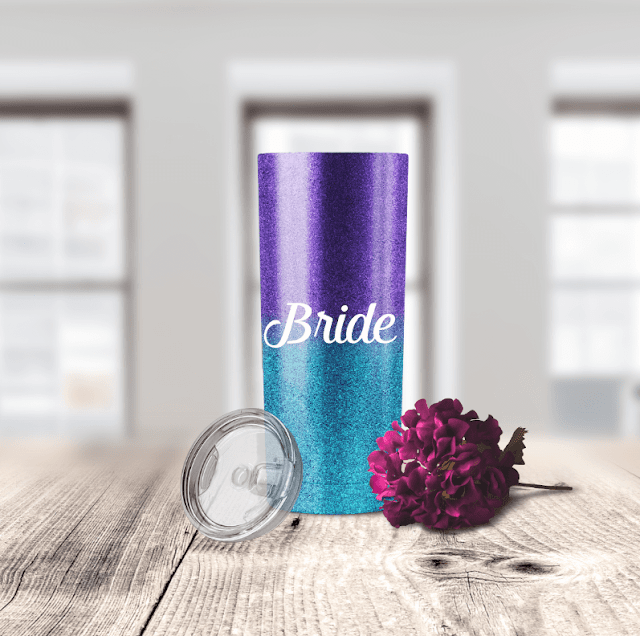 So many Silhouette crafters use their machines to make things they sell, so today we're going to talk about how to make realistic mock ups for drink ware! Sarah from Sarah Design is here today to share some of her tips and tricks on making mock ups like a pro right in Silhouette Studio! Today I'm going to show you how to make drinkware mockups in Silhouette Studio. 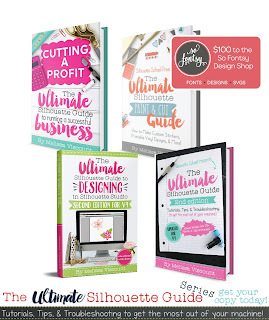 I'm using Designer Edition, but it's not a must-have to do this! 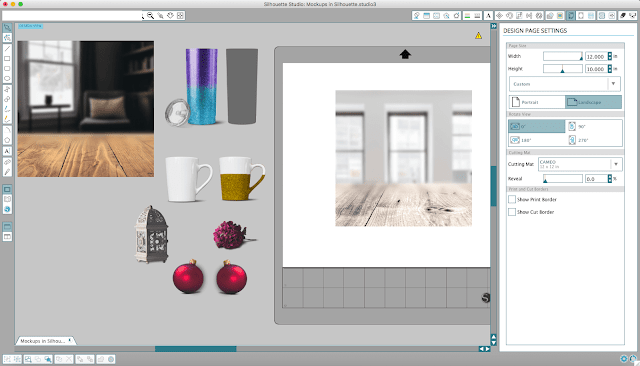 My favorite tool for creating mockups is Photoshop, but you can actually create basic mock ups in your Silhouette software. 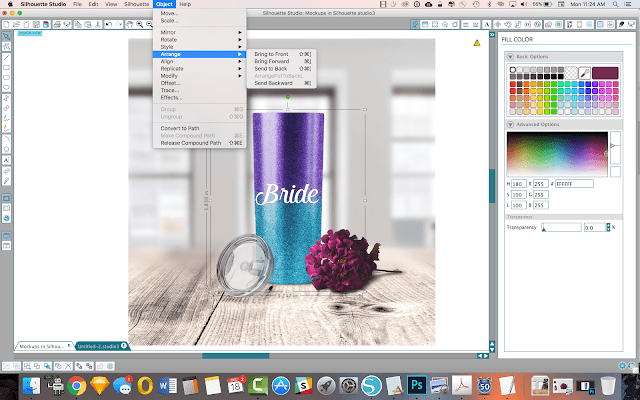 So if Photoshop isn’t your fave, or you aren’t ready to start trying it out, then you will be happy to see how easy it is to make a simple mockup right inside Silhouette (I’m using Designer Edition). Check out the video and post below - you’re gonna love it! To help you get started, I threw in a free background image for you to try out and practice with. 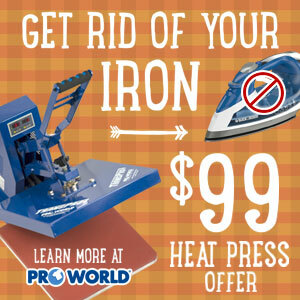 Click the image below to sign up and snag that freebie. It’s actually pretty easy to put together, as long as your mock ups are very simple and straightforward. No extremely curved/rounded objects or images that require a lot of editing beforehand. 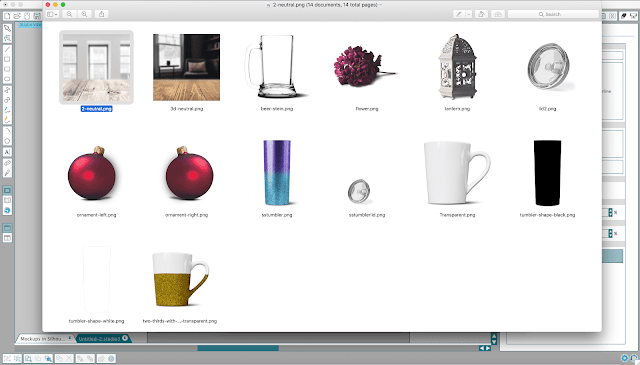 All you need is a decent background image and some transparent png versions of your product (mug, wine glass, etc). You can make create transparent versions of your images, by using the trace and detach and/or the Magnet trace. Melissa shared tips on this method in this mock up tutorial. 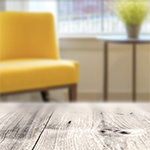 So for starters you’ll want to gather up transparent png versions of your beverage containers, some accessory images such as flowers, lanterns, ornaments, etc., and a background image, much like you would if you were doing a photo-shoot. 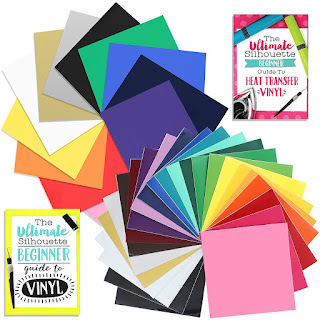 You’d gather up all the supplies you need to style your stock photo “scene”. You’re doing the same thing here, just all on the computer, inside Silhouette Studio! Here’s a screenshot of my folder of resource images that I’ve gathered for this tutorial. What are PNG and JPG files? Let’s talk about PNG vs. JPG for a second, so you understand the difference. JPG files are always “flat”, meaning there are no transparent parts on the image. PNG files have the ability to have transparency on them (fyi: they can be flat too). So when you snag a mug graphic for your mock up, you want to make sure it’s a transparent .png meaning it doesn't have a background. To remove the photo background yourself, you can do that in Silhouette Studio using this process. Your background file can be either format because it’s just a flat image. Easy-peasy. 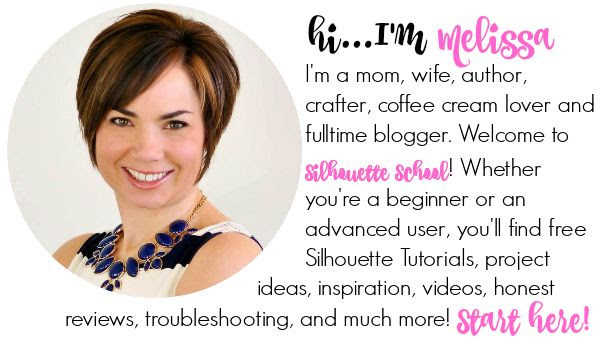 When you do this on your own, the first step is to create a new Silhouette Studio document, and start dragging in your backgrounds, drinkware, and accessories, plus your cut file design. Now your work area is full of things to make into a dozen scenes. Just drag you background into the center of your mat. 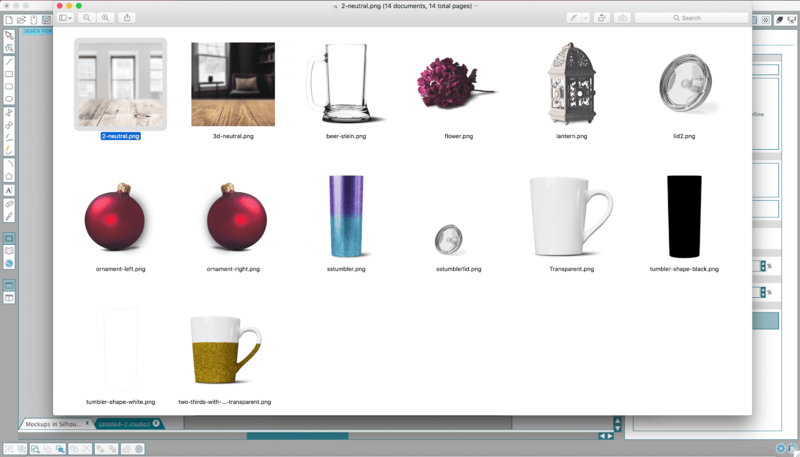 Then drag your cup or tumbler, over on top of the background image. You may need to re-order things by bringing items to the front or sending them to the back in the Object > Arrange menu. Or for a quick fix on bringing an item to the front, just do a quick cut and paste with your keyboard and it will move to the top of the stack. At this point you might be thinking, “Ok, but then how do you style the scene? How do you know what to put in there?” The answer to that depends on why you are making the mock up. Here’s a scenario…. I could just send her an image of a font and say “this is the font”, or “yeah I can match most colors” but that won’t impress anyone. Instead, this my opportunity to make it really special, like I had her in mind, specifically, for this product. I do that by mocking up an example specific to her with a mug in a background, using her colors, and maybe with her flowers nearby. It’s fast and easy (and cheap!) with a mockup. There’s no need to waste materials creating her potential design just to take a picture of it to show her when she might not even buy it! Tip: Don’t bring in super tiny things and then make them huge in Silhouette or they’ll lose quality. Try to bring in graphics that are a bit on the large size because you can make them smaller and they’ll still stay sharp and crisp. This is a snap to create. I can pull in a background and a mug graphic to get started. 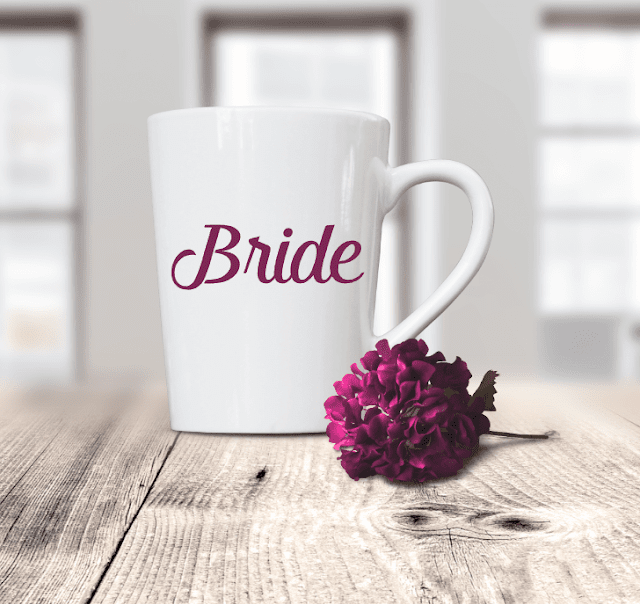 I just grab a flower png in burgundy (I colored mine in Photoshop, but you can also change the color using the Image Effects tool in Silhouette Studio) and pull it into the scene next to the mug and resize. You always want to make sure that the scale looks realistic so the accessory isn’t too big or too tiny in comparison to the product. Just use your best judgment and resize as needed. Now that the scene is staged, it’s time to add the cut file design. If you already created a cut file, you can just bring it in from your library by first locating the design then right clicking > merge. 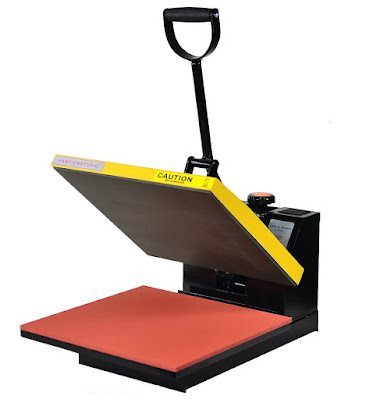 This will put the cut file in the same work area. If you are creating your cut file - such as a line of text - use the text tool and type out the word - in this case, “Bride”. Then I chose a pretty font - I picked “Kathya”. Turn off the line color and change the fill color. I used the eyedropper tool in the color menu to sample the burgundy color from the flower in the scene. And here's what I ended up with. Tip: If you get a squiggly blue line under your text that’s because Silhouette thinks it’s misspelled. You don’t want that showing in your final mockup image. Not to worry, it’s easy to fix. All you have to do to get rid of the blue squiggle is to right click on the word and choose “add to dictionary”. Let’s look at another mock up example. Say we have a glitter-dipped stainless steel tumbler with a plastic lid next to it. We just drag our mug and flower away and bring in the tumbler. It can be centered or even off to one side if you know you want to add text next to it. Whatever you think makes sense for your mockup. You could add other drinkware next to it if you wanted to show the breadth of your product offering. Or just focus on the tumbler alone. If you find yourself adding something to the scene that looks like it was shot in completely different lighting from the background you’ve put behind it, (ie: your tumbler is bright and shiny but the background is muted) don’t fret - I have a solution! A handy trick is to bring in a black shape (same shape as your tumbler) to place over top of it. Then just adjust the transparency so you can see through the black shape to the tumbler underneath. This is a workaround to “dimming” your image. You just select your black shape, then go up to Color and into transparency, and if you pull the control all the way over to 100% transparent, you can totally see through it as if it isn’t even there. But if you pull it back a little bit, like to 80% or 50% then the tumbler becomes more visible underneath until it looks more natural. Another nuance of this mockup scene is in how you handle the plastic lid. In “real life” the lid is transparent. We’d be able to see the tumbler through a lid leaning against the front. So to make this look more natural, you also want to play with the transparency. Just adjust it a tiny bit so you can barely see through it, and it will look more and more like a real photo you took in your home studio! At this point, we could accessorize some more if we want. I like to think of this like decorating a dollhouse. It’s seriously so fun to just make little scenes all day once you have the png “dollhouse supplies” in your toybox! 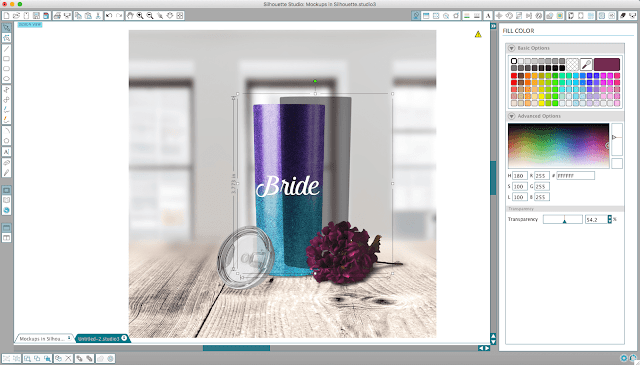 If you have Silhouette Studio Business Edition the easiest and fastest way to save is to select the entire scene. Then go to File > Save Selection > Save to Hard Drive. Change the file type to JPEG and decide wherey ou want to save your image on your computer. 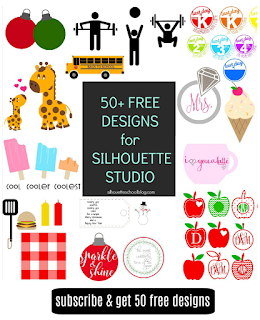 You've just created a JPEG version of the mock up you made in Silhouette Studio. If you don't have BE, when your scene is completed, zoom in as much as you can and then take a screenshot with whatever tool you have on hand that allows you to select a portion of the screen to “photograph”. On the Mac I click Command Shift 4, and get a crosshairs that I can use to drag over the portion of the screen that the mockup is in. It saves automatically to my desktop and I can rename it and put it online. There you go! 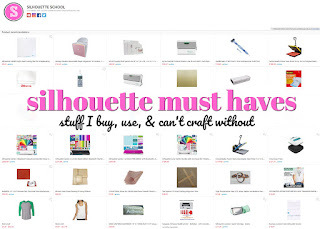 That’s all you need to do to successfully make a mockup in Silhouette. If you missed the link above, here’s that FREE BACKGROUND IMAGE again for you to use to try this out on your own. I hope you enjoyed this tutorial! If you’re a drinkware seller looking to harness the power of mockups, I’d love to invite you to come find me at sarahdesign.com and in my free Facebook group, Mockups for Drinkware Makers. I can’t wait to get to know you better.